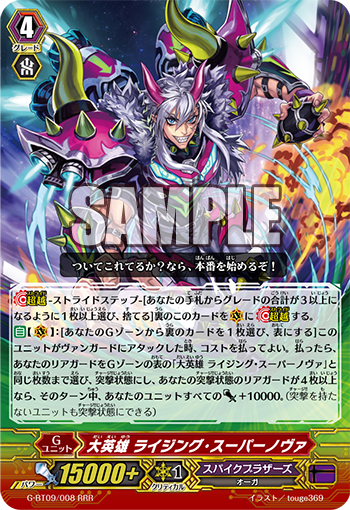 Auto (RC) GB1: [Soul Blast 1] During a battle in which this attacks a Vanguard, when an opponent’s Unit is placed on (GC), if this Unit is charging, you can pay the cost. If you pay it, choose 1 of your opponent’s Grade 2 or lower Guardians, Retire it. Auto (RC) GB1: [Counter Blast 1] When this Unit becomes charging, you can pay the cost. If you pay the cost, during that turn, this unit gets power+4000 and “Cont (RC): This Unit can attack from the back row.”. “Great Hero, Rising Supernova” is a finisher card suitable for 《Spike Brothers》. When it attacks the opponent’s Vanguard, you can flip a card in your G Zone face-up, and then make an number of ally Rear-guards Charging equal to the number of “Rising Supernova” face-up in your G Zone. What, it can make even Units without Charge Charging!? And if there are at least 4 Units Charging, regardles of “Rising Supernova”‘s ability or not, all of your allies gain 10000 Power!! And Rising Supernova gains 10000 Power as well, meaning in the end, it’s a 36000 attack. Grant Power to all of youe allies, and quickly deal a deadly blow to your opponent! “Mayhem Tiger” is a Grade 2 who serves as an incredibly powerful attacker when it’s Charging. By Soul Blasting 1 card, when a Grade 2 or lower Guardian appears in your opponent’s Guardian Circle, you can Retire it!! And since it’s not limited to once per turn, it’s an ability you can keep using as long as you keep paying the cost. It can deal incredible pressure to your opponent! “Fullspeed Specter”, while charging, can Counter Blast 1 card, to have it gain Power+4000 and it can attack the Vanguard from the back row! Since it’ll be Power 11000, it’s possible for it to attack a Grade 3 Vanguard. When you’d like to increase troublesome attacks, this is the Unit for you. “Divine Dragon Caper” includes many cards that enhance “Raging”. Let’s set a rush with the 《Spike Brothers》 Clan ability 【Charge】!